Shortly after SFR's much-hullaballooed 2013 Summer Guide hit the stands, Alma López started getting phone calls. A veteran of "sacrilegious" art, López made an indelible mark on the local scene in 2001. She submitted a 14- by 17.5-inch digital collage print depicting Our Lady of Guadalupe in a two-piece made of Castilian roses to the Museum of International Folk Art's Cyber Arte: Where Technology Meets Tradition, an all-female exhibit curated by Tey Marianna Nunn, now the director and chief curator of the National Hispanic Cultural Center's museum and visual arts program. "Our Lady" by Alma Lopez ©1999 (Special thanks to Raquel Salinas and Raquel Gutierrez). Shortly after its Feb. 25, 2001 opening, local demonstrators demanded the image be removed from the state-run museum. Choice words included "pervert" and "witch." It didn't help when her sexual orientation was brought into the mix. "That's when the homophobia started," she says. At the time, Santa Fe Archbishop Michael J Sheehan issued the following statement: "The picture does not show respect for the Virgin Mary as the artist claims. Instead of showing her as the innocent Mother of Jesus, she is shown as a tart or a street woman, not the Mother of God!" For López, the uproar was flecked with discrimination. "At times like these, some conservative Catholics highlight the misogynist patriarchy of the church, which finds women's bodies inherently sinful, and thereby promoting hatred of women's bodies," López says. Referencing SFR's recent cover illustration, she adds, "There's nothing wrong with a woman's body. I don't see what is so sinful nor terrible about this image." "The controversy in Santa Fe was incredibly difficult, so I kind of sympathize with all of you," she says, lightheartedly. López claims that her image was meant to be empowering—a feminist statement and a declaration of indigenous pride. "I didn't intend to do something negative. I took it as an opportunity to study history a little bit more," she says. López put her findings in a book titled Our Lady of Controversy: Alma López's "Irreverent" Apparition, co-edited with her wife, Alicia. More than a religious symbol, the imagemaker says she saw the icon as an artistic one—a public fixture whose roots are more cultural than spiritual. "I was born in Mexico and raised in Los Angeles," López says. "I didn't only see her in churches, I saw her at home, at my tías, and also in the neighborhoods, on murals, the local store, on Lowrider magazine, on tattoos…everywhere. So for me, she represented culture, community and family." López' perception of the symbol was further influenced by a Chicano Studies course she took in college. 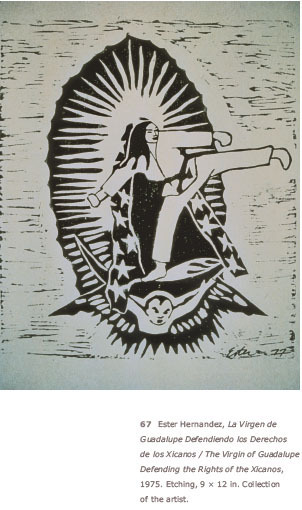 "I saw that she was present in very significant, revolutionary moments for our Mexican and Chicano history—during the Mexican Revolution, and then also in the Chicano civil rights movement," she says, adding that the icon was also a staple in the women's liberation movement, primarily through the art of Yolanda López and Ester Hernandez. For López, the Madonna's image had been elevated to that of "revolutionary activist." Walking in her predecessor's footprints, she's still surprised by the reaction the image caused. "This is nothing new," López says. "This is a discussion or conversation among Chicana feminists that's been going on since the late '70s at least, so I am surprised." The print itself spent a decade in storage, then was exhibited at the Oakland Museum of California in 2011. The picketers came soon after. López is taken aback by how little things have changed in 10 years. "I would think people would have a different perspective on the image," the artist says. "From the very beginning, I was very surprised, because the image that I did is very much in line within the Chicana/feminist tradition of re-interpreting the Virgen de Guadalupe that was born in 1976 by Ester Hernandez with the 'Karate Virgin.'" Hernandez—a founding member of Las Mujeres Muralistas, an influential San Francisco-based muralists' group—would later, on the heels of Arizona's SB 1070, create a "Wanted" poster depicting La Virgencita as a terrorist. "She has an unexplainable, possibly dangerous light emanating from her body which could contain explosive material," the screenprint cautions. "She is known to have a large loyal fanatic cult following." A permanent source of inspiration for López, several iterations of the Virgin have followed, including one titled "Lupe & Sirena in Love," which shows the Blessed Mother groping the mermaid found in the Lotería games' breast. "I am not the first Chicana to reinterpret the image with a feminist perspective, and I'm positive I won't be the last," she assures. Much like the model depicted in "Our Lady," López continues her journey with a self-confident, almost defiant stance. "We all have a right to express ourselves, whether we agree with an image or not," López says. She also offers the following warning: "Censorship hurts everyone. Censorship infringes on our rights to choose to see images. Difficult moments like these are opportunities for us to learn the truth about our culture and history."